Moscow-based designer Andrey Logvin has used thick Moscow snow as a medium for a temporary artwork dedicated to iconic British artist Damien Hirst. Initially, Logvin had the idea to sculpt some political leader’s portrait, but "the snow turned out to be tragically un-homogenous, so it started crumbling under my spade," the artist says (link in Russian). "Still, as an independent artist, I’ve learned that if something crumbles, you have to take a pause and figure out a way to create something better…"
The resulting snow skull became an homage to Hirst’s famous artwork "For the Love of God" (an actual human skull covered in diamonds), with paint spots sprayed on alluding to diamonds. 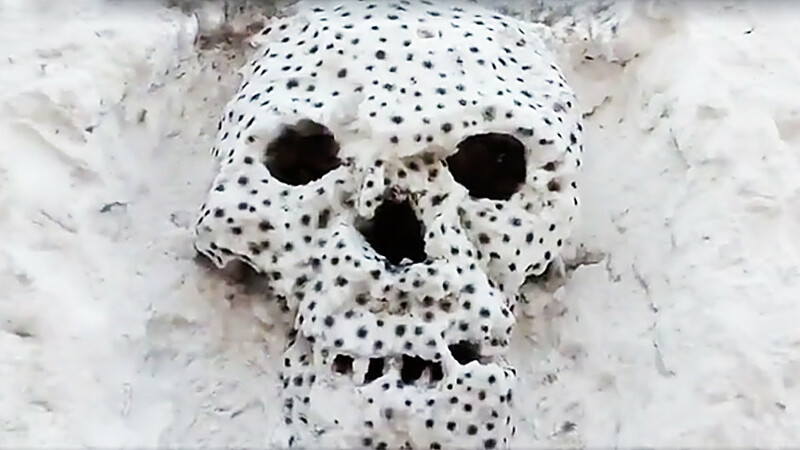 Logvin also recorded a short video where he invites Hirst to come to Russia for a joint project: "Damian, bro, come to Russia - we’ll make snow skulls together, see how splendid they are!" Andrey Logvin is a poster and graphic artist based in Moscow. He has won more than 30 national and international awards in poster art, among them golden medal of International Poster Biennale in Warsaw and Grand-Prix at Chaumont Poster Festival. He had also been awarded the State Prize of the Russian Federation in art and literature (2000).